Hemisphere, the world’s largest sailing catamaran recently completed by Pendennis Shipyard for American owners, has been a long time coming. 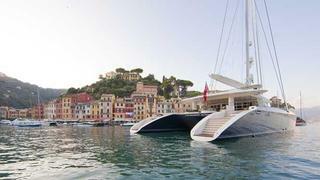 Since the late 1990s, her owners have chartered a variety of yachts – sailing and motor, mono and multihulls, big and not so big – giving invaluable experience to understand what it was they would want from a boat of their own. 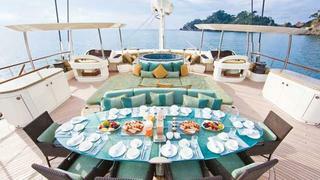 Between 2001 and 2003 the owners enjoyed several charters with Captain Gavin Bladen onboard a catamaran in the Caribbean. Both passionate divers, they had decided it was time they had their own sailing catamaran, and Bladen, a diving instructor, was keen to move on to something bigger. After a fruitless search for an existing boat they decided they would build a new one of around 35 metres. They selected naval architects Van PeteghemLauriot Prévost (VPLP); multihull specialists responsible for Jules Verne record holder Groupama 3, 33rd America’s Cup winner BMW Oracle and the 41.5 metre sailing catamaran Douce France. In the end the new boat grew to 44.2 metres, which was about as big as she could be without going over 500 gross tons and entering another world of regulations. US yard Derecktor was initially chosen for the build, and work started in late 2005 with completion scheduled for November 2007. However, with the boat running late, Derecktor experienced financial difficulties in 2008 and the search for another builder began. Out of 18 shipyards under consideration Pendennis was chosen based on a facility to cope with the beam, engineering ability and favourable exchange rate. And so in the autumn of 2009 the boat arrived in Falmouth, UK, on the deck of a ship, along with 13 containers worth of equipment. Almost two years later, Hemisphere was moored up outside the Pendennis dry dock in which she had been completed, ready to sail for the Mediterranean. Michael Leach Design (MLD) was responsible for the interior and the styling of the exterior guest areas. VPLP purposely set out to keep the vast deck spaces uncluttered by winches, bollards and other deck fittings which are well disguised and MLD made the most of the potential by creating ‘places where you can sit and perch and talk to people’, as Bladen puts it. The sun deck – accessible from the main aft deck by a single flight of stairs on the port side – is dominated by a spa pool between the two helm stations. Aft, an oval dining table for 12 has a map of the world etched into its glass top, but another oval table on the deck below will be the boat’s main dining area. In foul weather the area can be enclosed with a screen and, if necessary, air-conditioned. 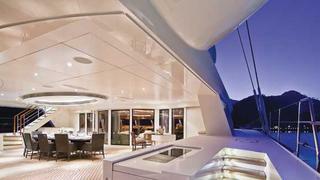 Two curved sliding doors lead from the aft deck into the 100 square metre saloon, which has several distinct zones. One of these is a seating area, raised to maximise the stunning all-round views, the design of which MLD included in the initial proposal which secured their contract. Forward of the saloon a small lobby area leads to a guest cabin in the port hull, a day head to starboard, and the two VIP cabins. 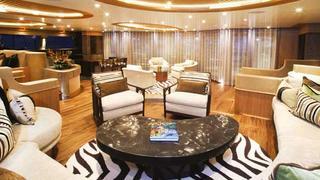 The owners like to spend their time in the large communal areas onboard with their family and friends, however the cabins are comfortably proportioned with the two VIPs offering the option to open up into one space via a central partition and its component cupboards which can be quickly stowed, leaving a 16 metre wide master cabin with ‘his and hers’ bathrooms. Aft in the port hull, and accessible from a companionway on the main deck, there are two further guest cabins, one of which is specifically for the owners’ grandchildren with two fixed and two Pullman berths. Across the deck another companionway leads to the crew accommodation, which occupies most of the starboard hull and is also accessible through a sliding door from the saloon to the well-equipped galley. 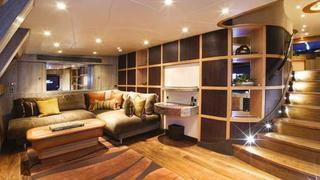 Forward is a crew mess and laundry area, and aft there are three comfortable cabins; the captain’s would meet the standards of a guest cabin on many a yacht. 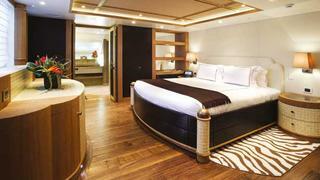 ‘The key words in the design brief from the owners were “Polynesian six star luxury”,’ says Mark Smith of MLD. Although there is a theme of walnut soles and panels in brushed oak and wengé – all of which have a deliberate textured feel – no two cabins are the same in layout or styling. A total of 18 leathers have been used, including crocodile and stingray skin, and there are 15 types of stone. Midships in each hull there is an engine room, both housing a Caterpillar C12s 490hp engine driving a controllable pitch propeller. There are three Caterpillar generators with a total capacity of 251kW, and each hull has a thruster fore and aft. Other technical features of Hemisphere include a Radio Zeeland control and alarm system with 550 separate functions ranging from standing rigging loads to fridge temperatures; programmable lighting; navigation, communication and AV equipment supplied and commissioned by HST with a Crestron control unit in each cabin. The main tender – a Scorpion 8.2 metre RIB – is ingeniously housed below the aft deck from which it is launched and recovered through ‘bomb doors’, prompting James Bond quips. The second tender is a 4.5 metre Castoldi RIB that lives at the aft end of the starboard hull and is launched by a C Quip beam crane through a top-hinging door on the inboard side of the hull. 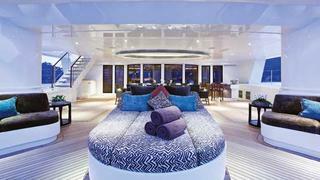 UK-based BMT Nigel Gee Ltd were responsible for the engineering of these unique spaces as well as the entire structure of the yacht. The owners’ priority with regard to toys is the diving equipment, and the aft end of the port hull is dedicated to this, including the provision of a spinner to dry the wetsuits. Other toys include kayaks, wakeboards, water trampolines, SeaBobs and a diving springboard which can be bolted on to the starboard stern. Hemisphere’s maiden voyage and her successful inaugural cruise with her owners was followed by an appearance at the Monaco Yacht Show. 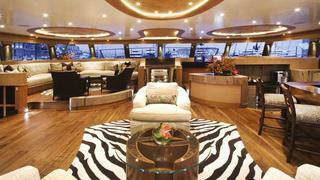 She is in the Caribbean for the winter season, where she will be available for select charters through Burgess.